After a couple of unseasonably cold and gray days that warranted warm socks and a sweater, we’ve returned to hot (+90F) and sunny again. I return to monitoring my one barrel of rain water, which is about 1/5 full (empty). The couple of rain storms we’ve had and the one night of drizzle failed to fill the bin, let alone my array of four 275 gallon bins. One can have all the storage one wants, but one can’t make the rain fall. The garden was getting on parched yesterday so I watered with the precious rain water, adding a half cup of fish emulsion and a cup and a half of compost and comfrey tea to each watering can. 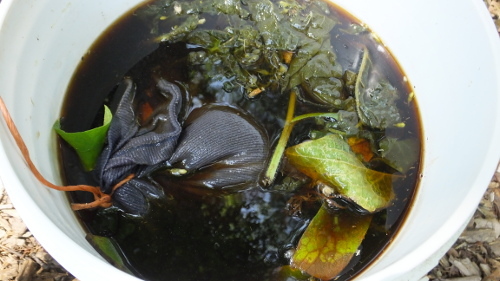 The tea I had started four days ago: dropping comfrey leaves into the bottom half of a five gallon bucket, adding about two gallons of rain water, then putting about ten cups of fresh compost into a cloth bag and submersing it. Put lid on, put in dark shed, let bubble away. It smelled sweat, going on yeasty, with the typical comfrey smell that I’ve not been able to describe – something like molten rubber? Anyway, it was ready. Though even hotter today, the plants, even the usually droopy tomatoes, look great. I hope the calcium rich comfrey will combat the blossom end rot I’ve spotted on some of the squashes. Looking west of the garden, here’s an update of what’s going on with the front of our property. 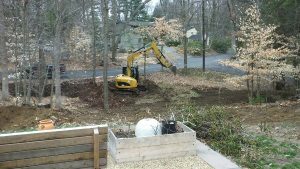 In February we had a landscaper come with a track hoe to excavate the weeds, brambles and vines that we had combated year in year out – pulling, digging up, covering with cardboard and wood chips – losing the battle. In four hours he had dug them up with the big scoop and put them on one big pile. Then he churned up the massive leaf and wood chips piles that my neighbor had been depositing on our property for years. It looked like a lot of fun, like stirring a massive pot of soup with a massive ladle. This mix he deposited on the newly bared earth, at about a foot deep. On the slope I sowed white clover, which took really well and is now feeding the rabbit population. 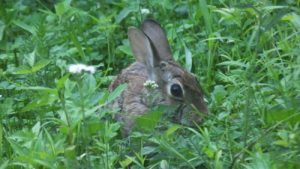 I am not sure this is a good idea, but on the other hand, I haven’t had rabbit herbivory in my garden at all this season. Also, it is fixing nitrogen, out-competing most weeds and stopping erosion very well. Notice the new pile of wood chips in the center. It’s an intriguing idea: you basically cultivate a herd of anaerobic bacteria, then you harvest them by killing them by exposing them to oxygen, then give them to the (aerobic) fungi as a meal. It’s like growing fodder for your livestock, only your fodder is bacteria and your livestock is fungi! 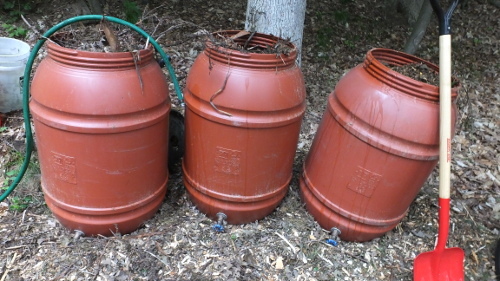 Here are my barrels, filled to the brim with a mix of soft and hard woods and tap water that sat out in open buckets in the sun for several days to dechlorinate. I’ll drain the barrels in a couple of weeks and we’ll spread the fermented chips and start a new batch. Hopefully, we’ll have great mycelium running soon!